Minnesota may be the "Land of 10,000 Lakes", but Wisconsin is home to more than 15,000 lakes of it's own. The three Madison Lakes - Mendota, Monona, and Wingra - were a huge part of my childhood. We took swimming lessons, canoed, and fished on Lake Wingra; waterskied on Lake Monona; and sailed, ice boated, and watched 4th of July fireworks on Lake Mendota. It was tough for both me and my sister to leave our hometown when we headed off to college, one of the key reasons being that we were both heading to schools in cities that didn't have lakes or any of our beloved lake activities. Upon arriving for freshman orientation at Indiana University in Bloomington, Indiana, my blissfly ignorant and somewhat sheltered sister asked the orientation leader, "So, where's your lake?" He looked at her like she was crazy and ignored her question. Sara only lasted a year at IU, and then she returned to Madison and the University of Wisconsin, where she could swim to class in the summer and ice skate to class in the winter. Well, she didn't actually swim to class. She did, however, ice skate to class. Our trip to Wisconsin involved - as we hoped it would - quite a bit of time spent enjoying the lakes. The cold, cold lakes. Luckily (?) 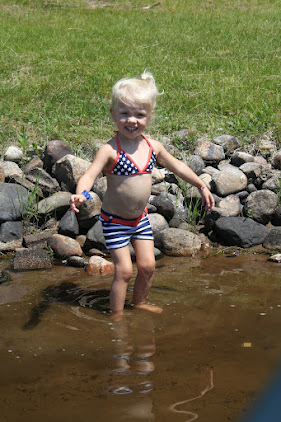 the temperatures in Wisconsin reached record highs during our visit and the icy water actually felt pretty good. 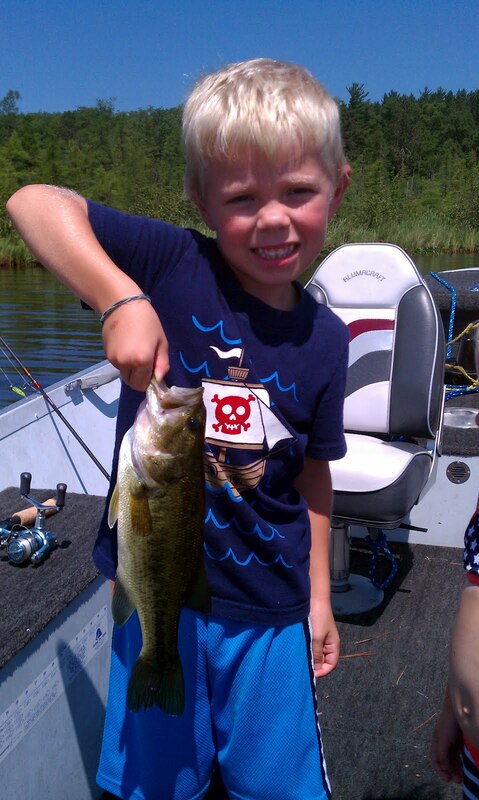 First up, Booth Lake in Northern Wisconsin. Catching and, as always, thumbing fish. Learning how to tread water. The pontoon boat wouldn't go fast enough for their liking. I was utterly shocked when Hallie said she'd try tubing. myself in a swimsuit on the internet. She did better than I could have hoped for - I was so proud! And finally, a little rest. Next up, Lake Mendota in Madison. Back in the tube again. who's never worn skis on try to control them in the lake. that he couldn't just stand up and ski, he never cried. Will into a skiing position. And then they had to do it all over again. Finally they were ready to go. but like I said, there was no actual crying either. A successful outing! Then Grandpa showed Will how it's done. And finally, we visited the beach on Lake Wingra a couple of times. I crave tuna fish sandwiches and root beer popsicles.